I hosted a game of AoS28 the other day. We had time afterwards to take photos of recreations of key scenes from the battle, so I made this writeup in my usual style. My opponent was Vladimir, whom I mentioned in my last post. 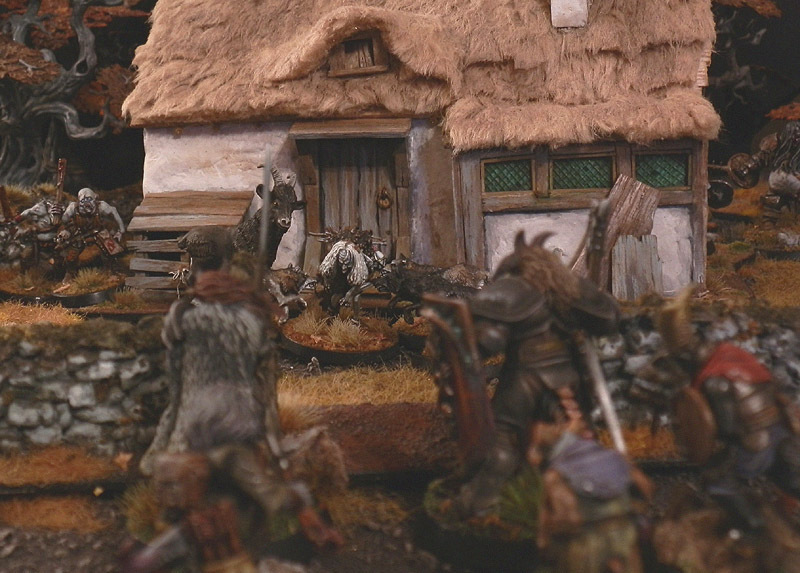 He visited Zagreb again this week, and this time brought a warband to play with. He had developed a backstory for the models, which helped me when I was coming up with a scenario and choosing which of my factions to pick as his enemy. We used AoS Skirmish rules, and the battlefield was my 3x3 feet board. 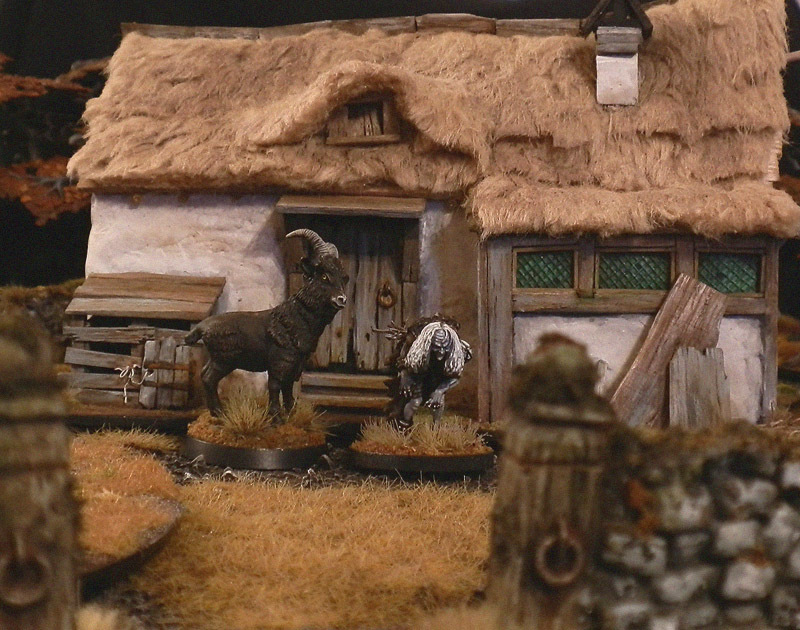 The cottage and willows I made for Legen had their debut on the table. 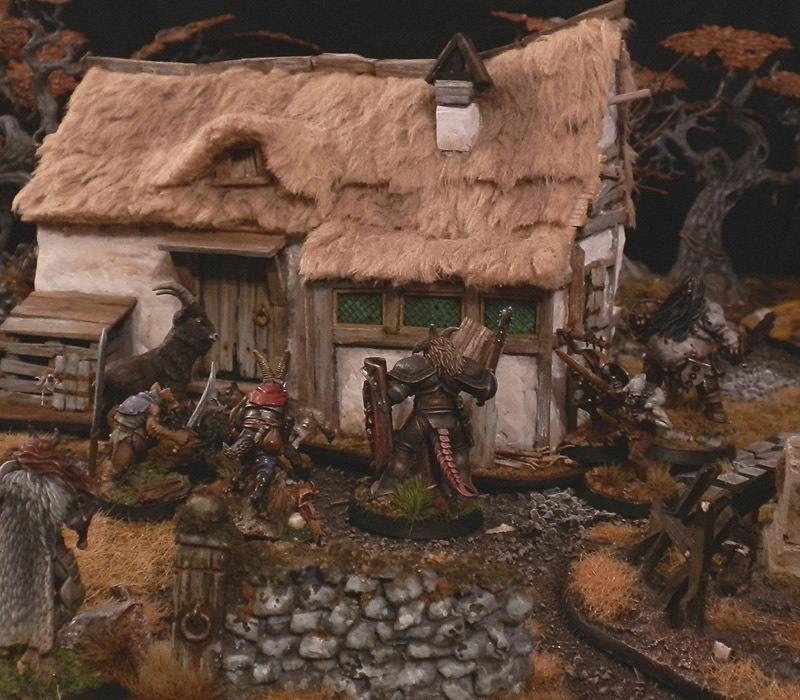 So here it is for your enjoyment: The Hag's Hovel Carnage. 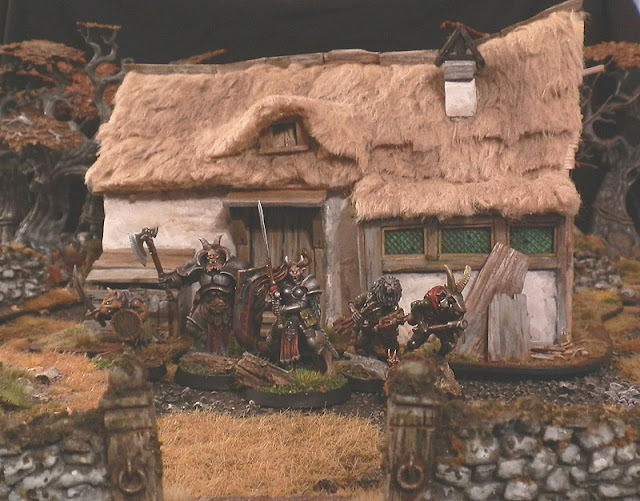 Vladimir's warband: The Damned Mercenary Company. Left to right: Miguel, Frederick Urs, Rebecca Von Todmorten, Aarnulf and Garth. "The origins of The Damned Mercenary Company are shrouded in mystery. They chose the ominous name for themselves after Felix Von Todmorten died in battle, and Frederick "the Black" Urs took on the role of company commander. He always was a misfortunate and brooding man, and thus he wanted to daringly spite the cruel fate. But bad luck continued to follow them. Under the new leadership the Company fell into severe disrepute. Most of the soldiers abandoned it seeing that they were truly headed for damnation. And so the Company became common thugs for hire, no more fighting glorious battles but chasing down outlaws, collecting debts and doing other sorts of dirty work. The next terrific blow came when they were hired by the witch hunter Titus Lucius to bring to justice Tashta, a well liked wisewoman, on charges of heresy and consorting with the Ruinous Powers. For when they came for her, the witching woman did indeed summon the dark forces, and laid on them a terrific curse.  They were all turned to beasts, sprouting horns and tails, fur and fangs. In the ensuing fight, Tashta did pay with her life, but managed to drag half the Company with her to the grave. 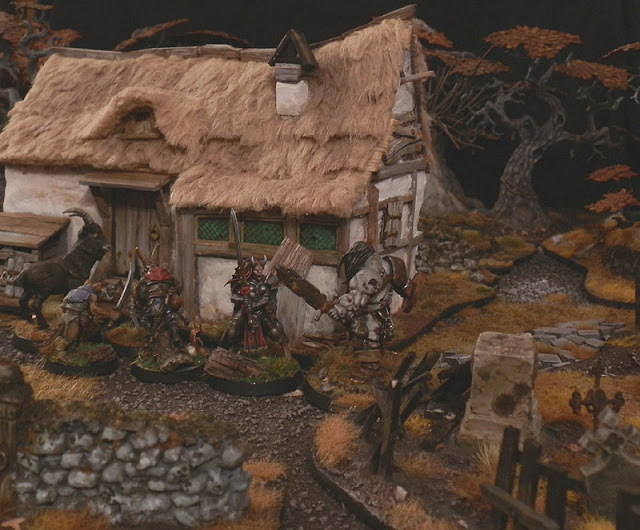 Thus the Damned were only five warriors remaining, marked for life by the witch's curse, despised by all, and soon to be hunted as abominations. Yet they refused to give in to hopelessness, and strove forth to seek redemption. Maybe someone could save them. Maybe even another witch. Frederick "the Black" Urs- A huge, courageous and capable warrior. It is unclear was he always fated for misfortune, or brought it down upon himself through wrong choices. Rebecca Von Todmorten- The surviving widow of the former company commander. Nobody knows what bound her to Frederick when all others abandoned him. Although a fierce fighter, she always had a noble spirit. But still she followed willingly into damnation. Gart, Aarnulf and Miguel- Brutes who stuck with the Company through it's decline, more likely because they relished the dirty work and cruelty then out of any sense of loyalty." Warscrolls for them were written right before the battle, based on their character and backstory. 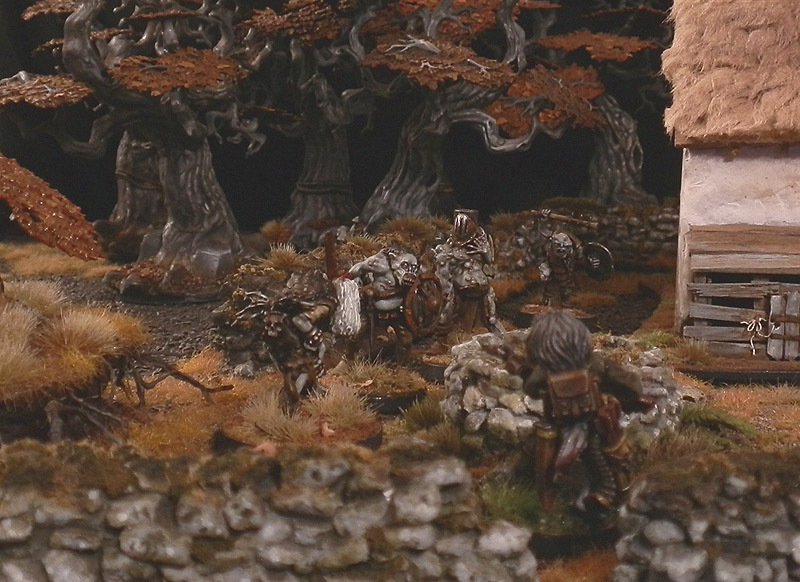 In our battle, the warriors come to visit the witch Baba Vanga, believing she can help them end their curse. Baba Vanga and Black Phillip. Vanga is a sister to Tashta, the witch responsible for the mercenary company's curse. The two were not on good terms with each other, so if Baba Vanga is capable of undoing her sister's spell, she is likely to be happy to do it. The Company are counting on it. Black Phillip is the witch's daemonic familliar. He, among other things, protects the cottage and its inhabitant from the dangers that lurk in the woods. Their warscrolls were made up on the spot. The witch was a spellcaster with common protective and offensive spells, and Phillip was a melee-oriented daemon creature. The pair were controlled by Vladimir. Janos the Cannibal and his witch-hunting retinue: ghouls and wolves of Folda. Janos used the rules for Crypt Haunter Courtier, the ghoul soldiers were Crypt Ghouls, and the wolves were Dire Wolves. Storywise it made sense to me for Janos to lead my warband. A handful of ghouls and wolves from my collection were selected to fill out the rest of the crew. On orders from his queen, Janos roams the land on a quest to eliminate any traces of Chaos he can find. Queen Ligia considers potential spreading of this corrupting force into her own kingdom a threat. Janos is a ruthless slayer with particular hate for Chaos. He does not need the cultists and abominations alive; in fact he makes sure the ones he catches are thoroughly obliterated - by devouring their bodies. He has been questing for years now, and his trophy collection as well as his ever growing girth testify to his skill at his job. Janos' Chaos-tainted diet is not without effect on his body, however, as visible from his tumorous sword hand. 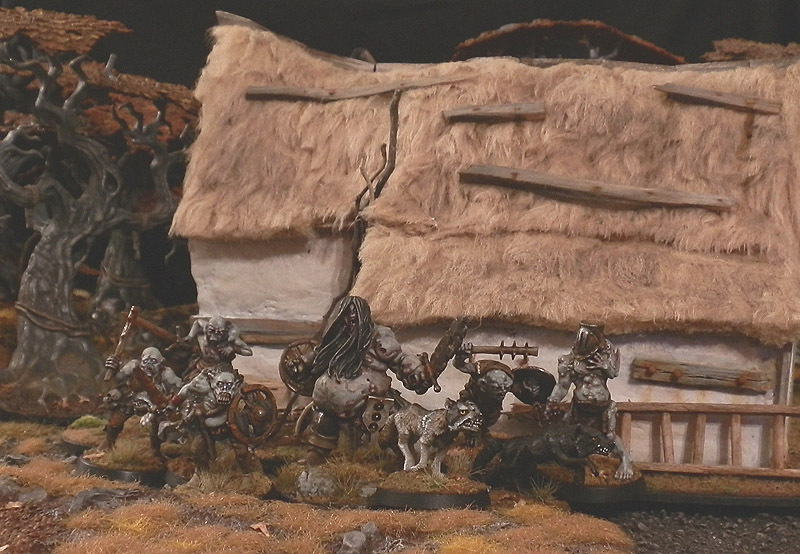 For some time, the ghoul witch hunters have been following a band of well-armed beast-folk on the border of Folda. As far as Janos knows, they are abominations of Chaos, and they need to be slain to protect the kingdom and all its people. Janos and his warband tracked the vile beings to this run-down house, and it turns out they've been led to even more Chaos filth. A witch lives here, with what seems to be a Daemon in the form of a huge black goat. 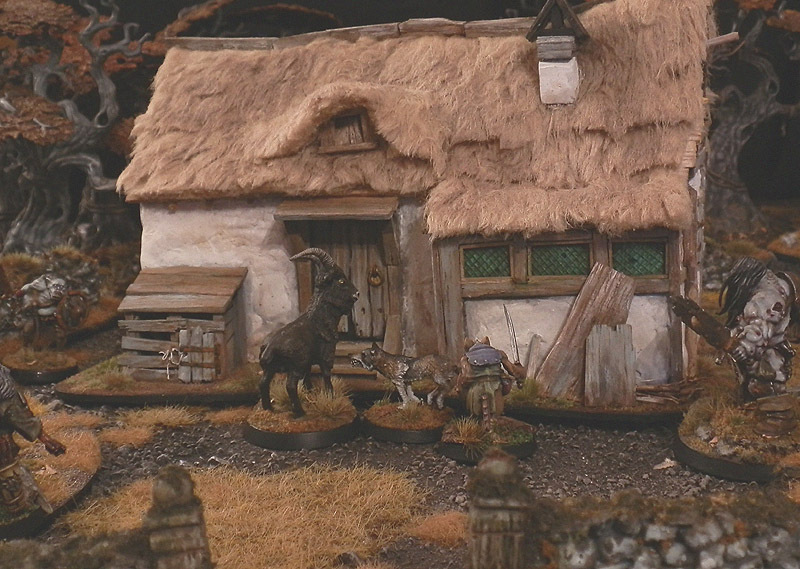 Deciding that this is the spot where he wants to engage his quarry, Janos commands his hunters to enter through the back yard, spread out and surround the hovel. There might be an opportunity for slaying the witch before the beastmen get a chance to rescue her. The swift wolves get to the witch first, just as the cursed reach the fence circling the cottage's front yard. Angered by this sudden monster attack and worried about losing their chance of getting their curse cured, the mercenaries charge forward to the old woman's aid. Black Phillip and Baba Vanga dispose of one of the aggressive wolves, and she manages to get away from them towards a safer position next to her well. 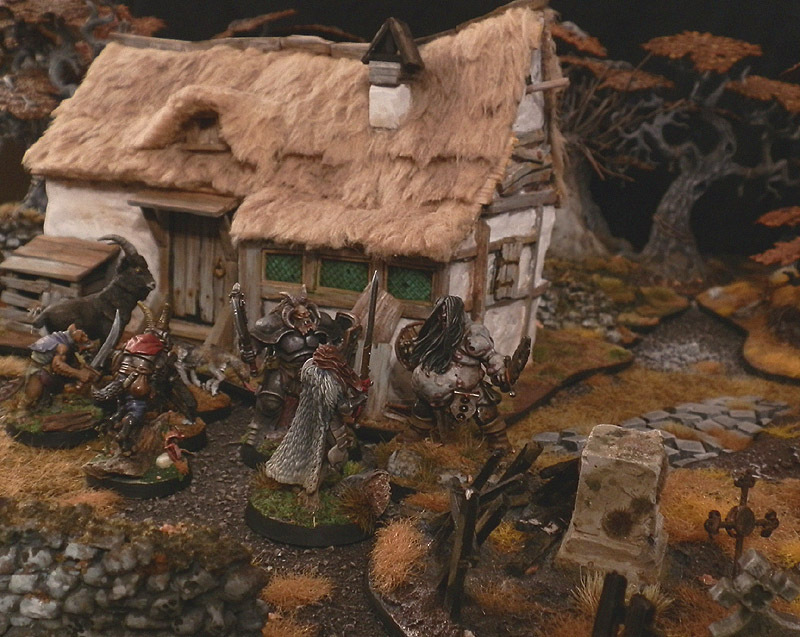 Frederick Urs, Miguel and Garth attack the remaining wolves. Janos and some ghouls are just around the corner at this point. Rebecca spots them, and lingers out of combat for the time being, waiting for the right opportunity to strike. Next to the well, on the other end of the front yard, Baba Vanga is facing trouble again. 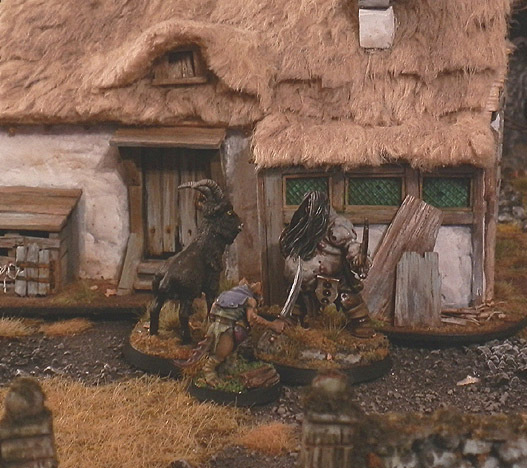 Aarnulf, the lion-headed mercenary, focuses on helping her out. He repeatedly fires his crossbow at the advancing ghoul creatures, while Vanga defends herself by casting spells. Janos himself finally joins the skirmish, but he quickly loses the support of his minions, who get mercilessly cut down by the blades of the Damned Mercenary Company. They were met by a swift counter-attack from Rebecca, who sprung into action when Janos moved forward, intending to assault Urs from the rear. 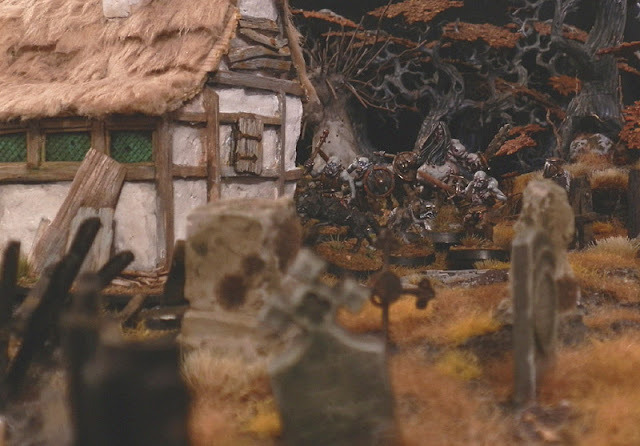 Despite getting shot at along the way, some of the ghouls manage to approach the hag and her protector, engaging them in melee. The leader of the mercenaries falls under Janos' rusty blade, but Rebecca is still standing and hitting back. The wolf pack is down to its last member, bloodied and facing two beastmen and the goat daemon. Only moments later things are really not looking well for the cursed company. Two of their mightiest fighters are down, and the enemy leader is set to continue his slaughter. Baba Vanga slays one of her attackers with an Arcane Bolt, but some of their attacks come through. Aarnulf is on the ground, so she has to wrestle with the last remaining ghoul all on her own. Unfortunately for the hag, the ghoul soldier prevails. When the battle was done, Janos and a single ghoul soldier were the only ones left standing. The black goat was the last one to die, though he did not crumple to the ground but rather simply blinked out of existence when Janos lopped off his horned head. The front yard of the cottage was littered with mangled bodies. The knight of Folda accomplished his mission, but the cost was steep. The Damned had fought well. The lone tired ghoul ransacked the cottage for anything of use while Janos was entertained with harvesting the hag's wrinkled head. It was a trophy which he would present to the Queen. The knight then rested, gnawing on Baba Vanga's bones, while the ghoul buried his fallen comrades. 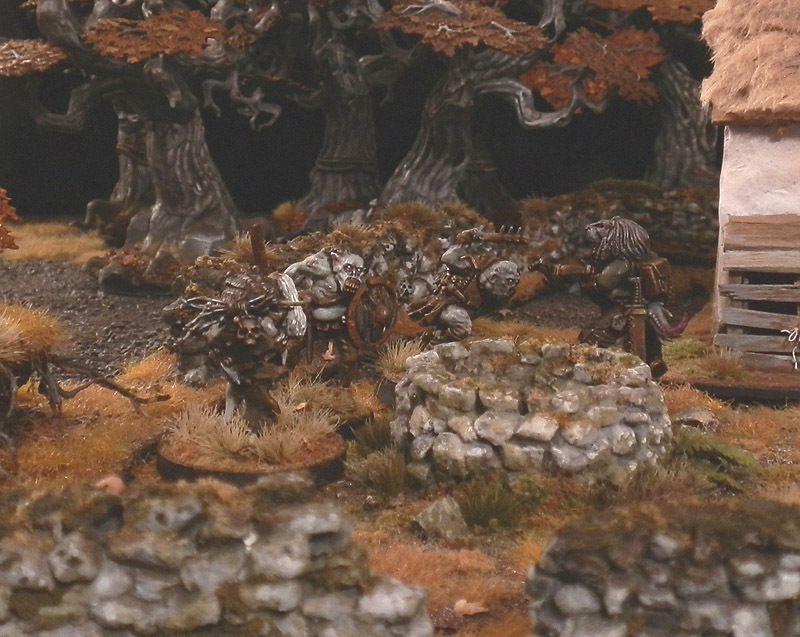 The beastmen were left where they had fallen, for the crows to pick apart. Before the two left the scene, they'd put the witch's hovel to flame; and by next morning all that was left was a black, smouldering heap. 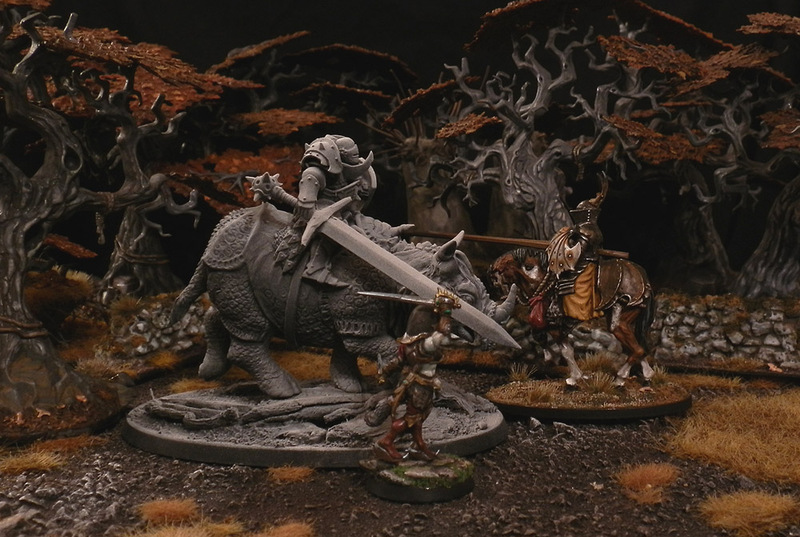 The rhino rider needs a bigger sword... gorgeous stuff as usual! The idea behind the sword is that it's almost unusable, he can barely hold it and use it as a Lance. I was hoping for it to look ridiculous, but not cartoonish. 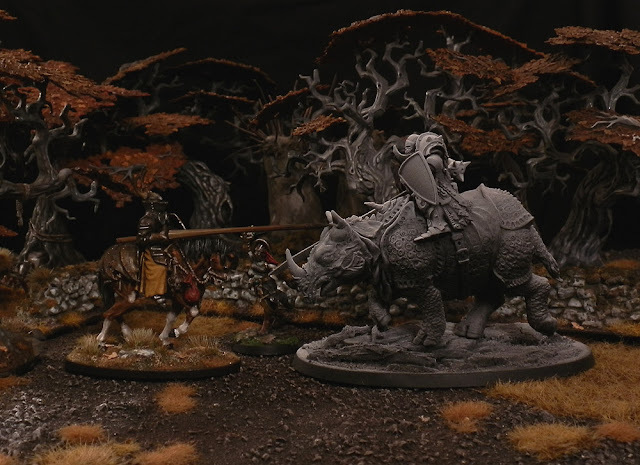 Fantastic work on the rhino, the knight's also nice with armour mimicing ride's horn. Sword brings Berserk to mind. What a fantastic story! 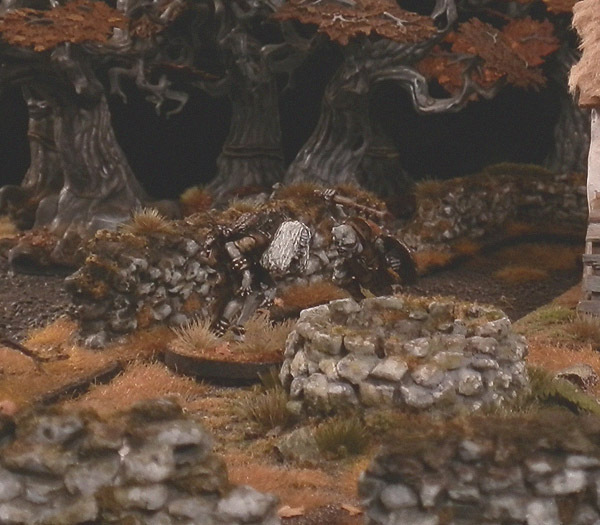 Love minis and terrain too! Very inspiring report, miniatures and terrain! I've been lurking for a while but it is time to give praise! Well done! Engaging tale and some beautiful models and scenery Ana. Vlad's Rhino is fantastic. He has some serious skills. Magnificent scenario! I love the reference to The Vvitch! Thank you! It's a marvellous film. Loved the report and the pics. Great work!